Jason Heath's Double Bass Blog seems to have linked to Mixed Meters, probably by accident. Even so, many thanks. It seems like a happening blog, with many features and contributors. I surfed past one DBBlog post entitled Advice for Aspiring Music Performance Majors. Of course I'm long, long past needing such advice myself but I never tire of reliving my own educational misery. Here's two bits of advice from that post that seem quite true to me. Music performance degrees are completely superfluous to your pursuit of a music performance career. Finally, if you ever plan on doing anything at all outside of music performance ... then a quality, well-rounded education is essential. This picture, first shown in this Mixed Meters post In Which Bulls Hit High Notes, last summer, visually portrays the perils of positioning a bassist, and I don't just mean "in Texas". When there's a bull in the band, who you sit behind is more important than who you sit in front of. and here's the Basses-R-Us Truck picture. Thanks for the link! I like your site and put it on my music blogs blogroll (no accident). I'm surprised that I just discovered it this past week--I found a link through oboeinsight, I think. 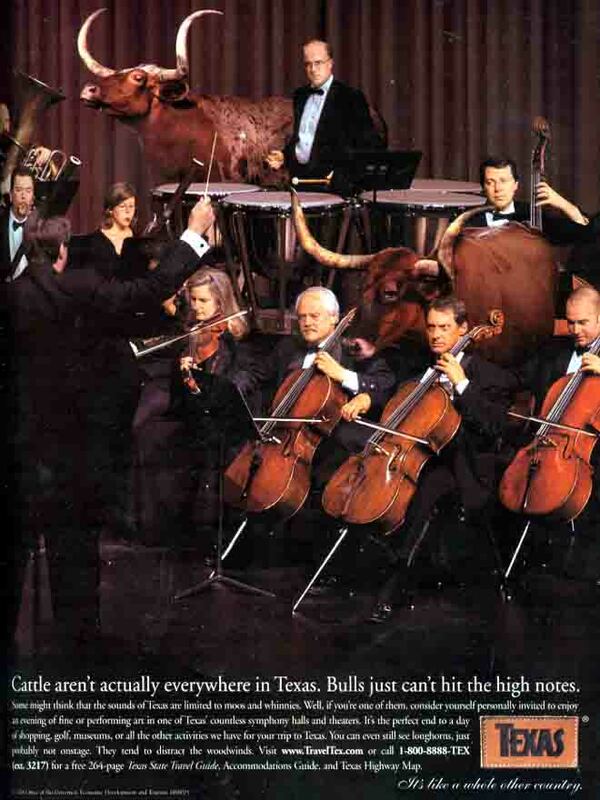 Anyway, I really enjoy your posts, and the ad for Texas is really awesome!